These are projects, which are rated under TEC (Technical Diving) by me. That is: how do I fix and carry more tanks, or how does a cave-diver carry his tanks. I am rather new in this area, but there are lots of possibilities for D-I-Y, because parts are either expensive or difficult to get or not exactly what you want. This harness is used by divers who want there tanks only at the side of the body (sidemounted). Especially in caves if you get to a narrow spot. You can by such harnesses at cave specialized dealers (at least in England). The blue strap material is made of two strips of stiff weightbelt material. The vertical straps sewn to it, hold the weighbelt and the D-rings. The measures are chosen to give an optimum fix of the weights. Don't use small D-rings as seen at the outer sides. They are not good to use with gloves. Between the D-rings there is only a loop for some future use. The weight belt is fixed with weighbelt stoppers. 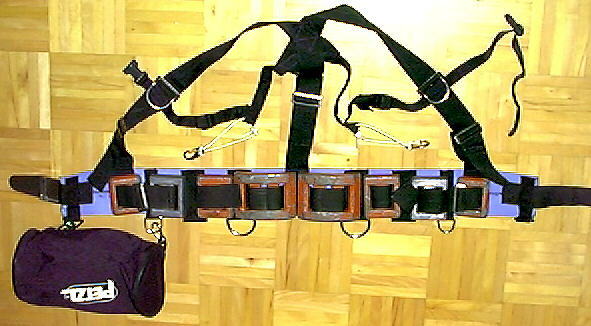 The harness is closed with a seperate belt which normally need not take any force. The shoulder belts are made like a pair of braces and meet at the back. Height adjustment is done with weightbelt stoppers. If you put two straps through each opening, they hold quite well. Above a D-ring at each side heigh adjustable with weightbelt stoppers. A small front strap with a fastex snap. Something new for me were the other small straps, which lead from the front strap below the arm to the back. They are adjustable in length and through a loop a bungee cord is mounted together with a bolt snap. The loop can go around the tank top or to the front D-ring. This way the tank is fixed but can be moved from below the arm to the front e.g. to close a valve. At the bottom of the tank a bolt snap is mounted which goes to the back D-rings. The pocket is not intended for diving and I still have to test the handling under water.